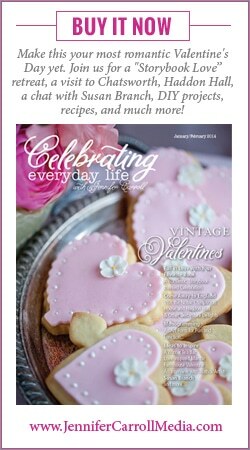 Celebrating Everyday Life with Jennifer Carroll, the magazine, Jan/Feb issue is now available! Every time a new issue comes out I browse through it and when I’m finished I think ‘no way can this get any better’. And every issue does – the creativity, photography, projects, and recipes are always amazing and wonderful. You really must get your digital copy now. And you can subscribe and get each issue as soon as they ‘hit the stands’ and at a cheaper price per issue too! Take a quick preview of what you will find in this issue. Wonderful isn’t it? 🙂 I’m so proud of Jennifer for the great job she does of putting it all together so fabulously and I’m so honored to be one of the contributors to this amazing magazine! Get your digital copy now 😀 A print copy is also available if you prefer that option. I order a print copy of each issue and I love the quality of the magazine and it’s just fun to have a print copy and see my photos and text in print. Have a wonderful week and if you are in the sub-zero midwest or north I hope you stay warm and safe. What a treat to find a new magazine! You certainly deserve to be part of such a beautiful magazine. I’m looking for new reading material. I’m off to check it out.